Tikipod Ltd has shared with us a brand new trailer for Rock Boshers DX: Director's Cut, revealing that the game will be headed to Switch early next month. 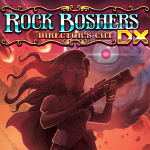 Described as an "exceedingly retro arcade adventure", Rock Boshers DX has you travelling back to the 1880s to help a young Queen Victoria fight her way across Mars in an attempt to escape from home. With video games not being a thing back in the 1880s, this game aims to look, feel, and sound like the 8-bit styles present in the 1980s instead, mixing top-down action and eight-way directional shooting in the process. You'll be blasting away monsters, "biffing" politicians, driving a tank, collecting snacks, meeting Charles Darwin, unlocking arcade games, outsmarting giant brains, and more; our chums over at Push Square noted that "while the game treads fairly common ground, the true retro callbacks, satisfying difficulty, arcade minigames, and audio comfortably set it above the sediment of what's average" for retro-inspired indies. The game will be available on Switch on 1st December, but pre-orders are actually going live as early as tomorrow (15th November). If you do happen to pre-order it, you'll benefit from snagging a 10% discount on the suggested price (which is to be confirmed). Do you like the look of this one? Have you played it before on another platform? Let us know your thoughts below. Retro just for retro's sake? Loving that MSX color scheme, but the general layout is a bit messy. And the sprites aren't all that. Which isn't out of line at all for the era they're trying to mimic, though, so hey. Looking to hear about how fun it is. Now that I'm gonna be throwing down in Diablo 3, Warframe, and MHGU for the foreseeable future I'm thinking these indies might need to start stepping it up a little for my attention. This? Not fantastic lol. That' the first 8 bit rendition of Rule Britannia I've heard. Also, "The guards are on a scone break" ?! The retro thing is really being done to death and a games needs to stand out to get attention. This doesn't do that. It just doesn't look good to me, everything's so tiny and messy. Yeaaah, I love good retro indies but this just looks off to me. I got interested. if the price is not high, I will get it. Well I actually like the lay out! I played this on the Vita, and actually rather enjoyed it! Nice fun little game. @Ooyah It is - one of my first PS4 games weirdly as I bought it for the Vita and was cross play - a free additional console download when I picked up the PS4. I liked the 'ZX Spectrum' style graphics option (this is what the graphics recall to me) and its quite a challenge. Really did seem like something I would play on one of the old 8-bit micros. The mini game with the sub was also quite compulsive. It was fun on the Vita, and played it through to completion, but I hardly remember any of what was shown in the trailer. I do remember enjoying it, and for those questioning the aesthetic, the game purposefully provides EGA and CGA graphics, akin to those available to early PCs. Wow they really nailed retro. The 8-bit computer art style is spot on and the whole thing sounds very electronic. I'm impressed. Game looks a crowded mess lol, but I am definitely fine with that! Interested. Besides...was that more Aqua Kitty to unlock? I have so many of the top down shooting games but this does look pretty fun. The early pc style graphics have a certain charm for me. Read that as Rock Lobster. Now I'm disappointed that there's no 8-bit B-52s game. If only I could properly see who I'm controlling from this mish-mash of pixels. Too much activity happening on screen. Hmm... it's so small lol! But overall, I would give this a go, just not in the day one kind of way. I'd like to see how it reviews if possible. No Physical options just eShop? I thought they figure out by now. I have it on pS4, it's fun in short bursts.